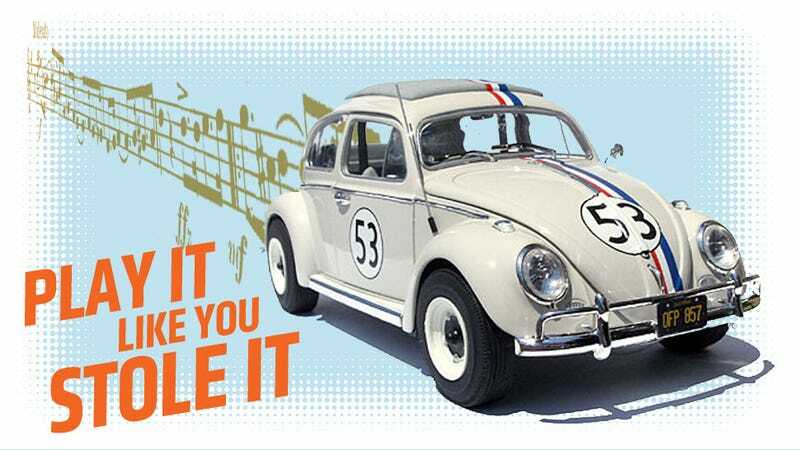 Was The Love Bug Theme Song Stolen? For many of us lifelong gearheads, our gateway drug to cars, provided to us as children, was the racing exploits of a sentient 1963 Volkswagen Beetle named Herbie. The music from that first movie, The Love Bug, still plays in my head when I actually manage to pass someone. But what if that famous music was stolen? And, just to make things more exciting, what if that music was stolen from the composer who composed scores for 11 of the 13 Bond films from 1963 to 1987? And the scores to Midnight Cowboy, Out of Africa, and Dances With Wolves. Did Disney really do this? Of course, I can’t say for sure, but I can give you some information and let you come to a conclusion of your own. The question of whether or not Disney stole the music for the Herbie the Love Bug Theme, which is used extensively in the film, came up when my friend, Tory Alonzo (original movie-Herbie owner and expert in all manner of Herbielore) told me about a rumor he’d heard, supposedly originating from a former Disney worker. The rumor suggests that Disney’s musicians were instructed to rip off a particular song for the primary theme for the movie, and also to be similarly “inspired” by the theme from the movie Grand Prix for the ending theme to the film. Keep in mind that this song came out four years before The Love Bug. Sure, it’s a little slower, a little different, but, let’s be honest, it’s not that different. If I wasn’t paying really close attention, I’d easily mistake this for the Herbie theme song. Maybe it’s my own Judaic, cynical, Santa-free upbringing, but I’m not hit quite as hard by this news. Honestly, I’m such a cynic that I would suspect a huge corporation like Disney was stealing things all the time. What surprises me is the brazen-ness of this possible act of musical larceny—Barry was no easily-intimidated starving artist, and those songs really, really do sound similar. The composer credited for the Love Bugs’ music was George Bruns, an accomplished musician and composer, and not someone you’d expect to copy someone else’s work. And, other than someone remembering part of a conversation decades ago, there’s not really any proof. The tricky part is that music plagiarism is not an easy thing to prove, anyway. There’s a limited set of notes in the western chromatic scale, and coincidences do happen. There’s nothing wrong with creating musical works that reference, imitate, sample, complement, whatever, another existing work. It’s a very muddy area, at best. I’ve been at Walt Disney Records for 21 years and the only materials in our archives would be the music and album packaging/liner notes. So sorry I can’t help! I’m stunned one of the biggest media corporations in the world even entertained the idea of investigating a probably unprovable allegation of musical plagiarism from a movie over four decades ago at all, so I guess I should be pleased about that. Still, these two scores sure do sound alike, right? If there are any music experts reading this, I’d love to hear your thoughts.